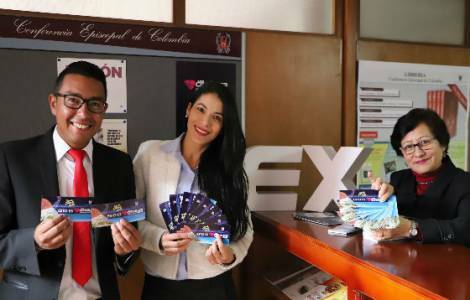 AMERICA/COLOMBIA - Expocatolica 2019: a great meeting space to "continue to walk together"
Bogota (Agenzia Fides) - "The Lord in the Gospel tells us that we are the light of the world and that light should not be put under a bushel, but we must put it high up, so that it enlightens all, this is what Expocatólica proposes, show what the Church does in so many fields of action, not only in the proclamation of the Gospel, but also in the social impact of the Gospel": these are the words of Cardinal Ruben Salazar, Archbishop of Bogota, who invites us to visit Expocatolica international 2019, which opens tomorrow at the Centro de Convenciones Ágora of the Colombian capital. From March 7 to 10, according to information sent to Agenzia Fides, over 160 exhibitors from Colombia and other countries, such as Mexico, Spain, Venezuela, Ecuador, will present creative and innovative experiences of the Church. Religious institutes, colleges, universities, dioceses, vicariates, parishes, social organizations of ecclesial commitment will share the testimonies of their activities. The initiative, promoted by the Colombian Episcopal Conference, includes 80 events including conferences, debates, concerts, theatrical performances, moments of prayer, to present the spiritual and pastoral richness of the Catholic Church, in its ethnic and cultural variety. The theme of this 2019 edition is "Sigamos caminando juntos" ("Let us continue to walk together") and uses as reference the invitation of Pope Francis during his visit to Colombia, in September 2017, to continue to proceed on the path of reconciliation. As explained by Fr. Jaime Marenco, Director of Communications of the Episcopal Conference of Colombia (CEC), in an interview with "Vida Nueva", "we are in a process of discovery that this country needs to be reconciled from the deepest heart of every human being. We have suffered a lot, in fact, the Church itself has been a cause of suffering for many, so when we come to these spaces where we meet others who do good things, provide services inspired by faith, we feel encouraged, we discover that we can also be part of that large number of people who are carrying out works for the benefit of the Church and of all humanity. Expocatólica becomes a meeting space that inspires us to continue walking together, to discover that we can not isolate ourselves".